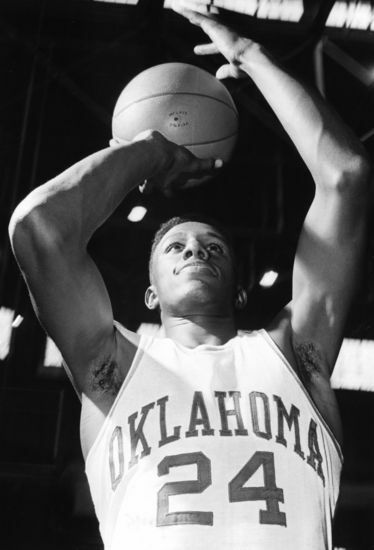 Named an OU Sooner Hoops pioneer for being the first African-American to play basketball for the University of Oklahoma, Harold “Buddy” Hudson will be remembered for that and so much more. Before his passing on May 14, 2013, his was a legacy of overcoming obstacles. Schools were integrated during his senior year of high school, helping to make him one of the first African-Americans to play basketball for the Purcell High Dragons. Later, when he joined the ranks of the infamous OU Sooners on a books and boarding scholarship, he worked during the summer on a road construction crew in order to pay for his own tuition. Buddy’s hard work was rewarded during the Sooners’ historic season opener on December 3, 1958. His courage and perseverance, as well as his role in breaking color barriers on a significant scale, will remain part of the OU legacy throughout its existence. Buddy’s career with the OU Sooner basketball team was a successful one. He lettered in the 1958-59 and 1959-60 seasons. But his achievements didn’t end there. He earned both his bachelor’s and master’s degrees and taught school in Oklahoma before moving to Kansas City, MO with his family. There in Kansas City he taught math and history for more than thirty-five years, and finally retired from the Kansas City School District in 2000. He was also my grandfather. He was dearly loved and he will be sorely missed, and I thank God to have had such a great man in my life. What wonderful memories. You and your family were surely blessed to have had Buddy in your lives.